Reservations are only available online. They are available throughout the year at Causeway, Ship Point and Wharf Street. The 2019 cruise season begins in a few short months, with the first ship arriving in mid-April. There has been a lot of discussion about the cruise industry in recent weeks. At GVHA, we monitor the cruise narrative closely and review news reporting, independent studies, and industry reports in detail. Recent stories raised questions about air quality, emissions, and what is being done to reduce and mitigate the impact of cruise. We’ll state clearly that, as an organization, we’re firm believers in working to find solutions. While we do not speak for the industry as a whole, or the individual cruise lines, we are in constant contact with the Cruise Lines International Association (CLIA) to seek their feedback and insights on how the industry is moving toward a more sustainable future. We’re also working directly with the 15 different cruise lines that call to the Victoria Cruise Terminal to ensure that their environmental practices meet our standards. Some of the initiatives that we have undertaken with respect to the environmental impact of cruise in Victoria are often underreported. We have committed to a fully-electric shuttle bus fleet by 2022. We currently have two electric double-decker buses on the terminal, but we will be transparent in stating that the technology on this equipment has been too unreliable to have them in regular operation. This is an area in which we are working with Pacific Northwest Transportation Services to find effective solutions to meet our stated goal. Our bus age requirements are some of the strictest of any port of call worldwide. Our age requirements ensure that buses must meet the highest EPA (USA) standard, or 2010 for bus engine age. As of 2019, all buses on the terminal will be at this level or newer. We support and fund the James Bay environmental air monitoring station. This station has not had any elevated readings in more than two years, and SO2 emissions remain well below recommended safe levels. You can look through the data here. We’ve initiated a proactive campaign to encourage the walkability to/from the Victoria Cruise Terminal to downtown via Fisherman’s Wharf and James Bay. This includes everything from improving wayfinding on the terminal to promoting the walking routes on our Wi-Fi login page. We’re proud to say that currently close to 30% of passengers disembarking ships calling to the Victoria Cruise Terminal choose to walk to the heart of the city when visiting Victoria. We’re actively studying the benefits, restrictions, and funding opportunities around shore power capabilities at the terminal. Finally, we’re in early discussions with a carbon solutions company to develop a full-scale carbon audit of the Victoria Cruise Terminal. This will provide us with further fact and science-based data to generate a baseline in which we can work to further reduce our carbon footprint. The Hyack Terminal provides float plane services and vessel moorage in the heart of Victoria’s Inner Harbour, on the edge of downtown. Marine adventure companies also operate from the Hyack Terminal facility. GVHA maintains the Raymur Point Customs Dock, operated by Canada Border Services Agency. The Wharf Street floats are located north of the seaplane terminal. This marina offers year-round transient moorage, monthly moorage, and low season moorage from October to May. The Ship Point marina is located in Victoria’s city centre, close to the provincial legislature, the famous Empress Hotel, and the Royal BC Museum. It is home to the Ship Point Summer Market and moorage space. This unique marine destination offers food kiosks, unique shops and eco-tour adventures amongst fishing vessels, pleasure boats with live-aboard residents, float homes, and commercial businesses. The Steamship Terminal building on Victoria’s Inner Harbour is a place steeped in Victoria’s maritime history. The Causeway marina is located in Victoria’s city centre, close to the provincial legislature, the famous Empress Hotel, and the Royal BC Museum. It is home to Jugglers Pitch, moorage space, and many events that are held year-round. Ogden Point is home to the Victoria Cruise Ship Terminal, Canada’s busiest cruise port of call. It is also home to a number of businesses including, Helijet, Breakwater Bistro, Seaspan, Western Stevedoring, and Whitehall Rowing & Sail. Built more than a century ago, the barrier-free breakwater offers the perfect spot for an oceanfront stroll. At 762-metres, the breakwater is home to Na'Tsa'Maht - The Unity Wall mural that depicts the art of local First Nations. 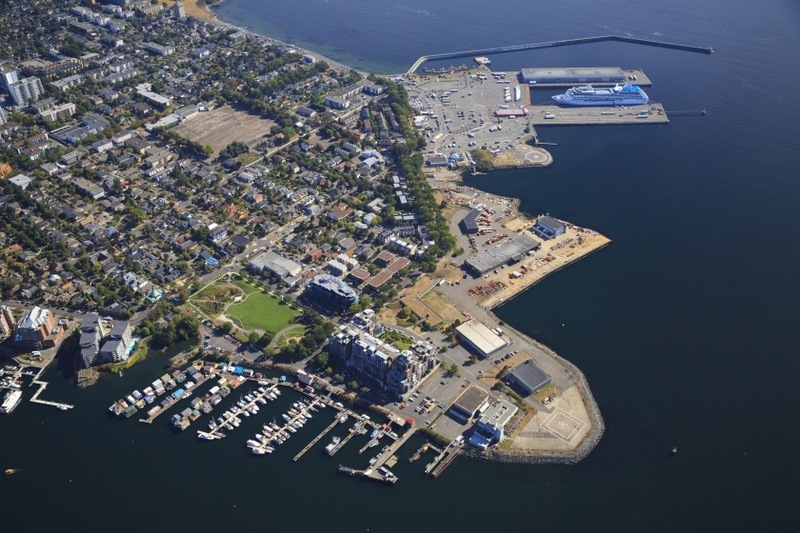 Greater Victoria Harbour Authority, a not-for-profit organization, owns and operates deep water, marina, and upland holdings throughout Victoria's harbour. Click on a pin on the map to learn more about each facility. Tap on a link on the map to learn more about each facility. © 2019 Greater Victoria Harbour Authority. All rights reserved.